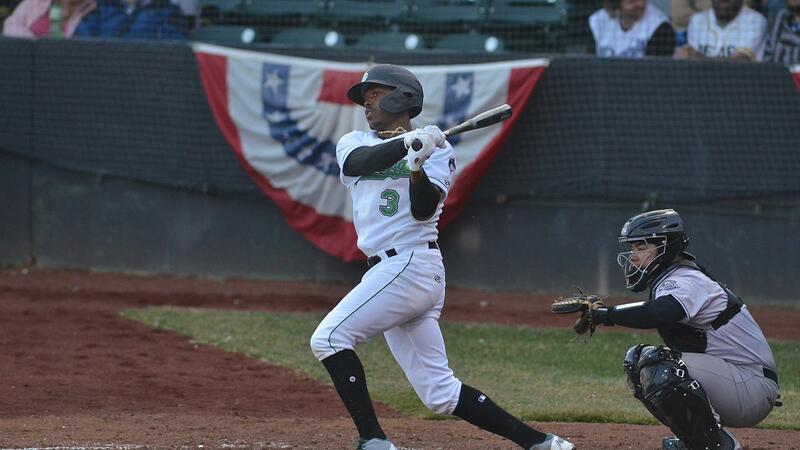 CLINTON, IA (April 7, 2019) - A three-run eighth inning home run by Alex King was the difference in a Clinton LumberKings 4-3 loss to the Kane County Cougars on Sunday afternoon. The LumberKings (2-2) held three different leads in the game but not could hold on as they season's inaugural series with Kane County (2-2) two game apiece. Peyton Culbertson started for Clinton and turned in the team's fourth straight strong start. Over a 5.2 inning performance he held the Cougars to just one run on five hits while walking one and striking out five. At the time Culbertson walked off the mound in the sixth inning he stood to be the winning pitcher but instead was given a no decision for his time out. In the bottom of the second inning, the LumberKings pushed across the first run of the game. Sean Reynolds started the rally with a one-out walk off Cougars starter Franklyn Soriano. During the next at-bat, Reynolds took second base on his first steal of the year and scored on a Bubba Hollins single to right tow batters later. The LumberKings added to their lead in the bottom of the fifth. Hollins again factored into the scoring -singling to leadoff the inning and scoring four batters later on a Jerar Encarnacion RBI single. Encarnacion's single forced Soriano from the game and pushed Clinton's lead to 2-0. Kane County cut the lead in half in the sixth with a Geraldo Perdomo double to straight away center that would be the only run charged to Culbertson. Clinton reclaimed their two-run lead in the bottom of the seventh. Demetrius Sims started the inning with a double and scored three batters later on a Jerar Encarnacion RBI single to right center of Cougars reliever Chester Pimentel. Leading 3-1, the LumberKings were just four outs away from a series win when Alex King slugged a three-run home run to left off Tyler Jones. The blast was enough to hand Jones (0-1) the loss for his 1.2 inning outing. Pimentel went the rest of way for Kane County and earned the win for his 2.1 innings of work. The LumberKings will play now welcome in the Quad Cities River Bandits for a four-game series starting on Monday night. Clinton will give the ball to Lefty Manuel Rodriguez (0-0, 0.00) who will be followed in a piggy back start by right-hander Alberto Guerrero (0-0, 0.00). Quad Cities will counter with right-handed pitcher Luis Garcia (0-0, 0.00). Everyone is welcome to come to Monday night's game and take part in free night! Admission free tickets are available to all at LumberKings fans at the ticket window at the stadium. Game time is slated for 6:30 p.m. (CDT). Fans looking to listen to the game can hear Erik Oas on the call on 100.3 FM WCCI and online at lumberkings.com via the tunein radio ap at 6:15 p.m. with the pregame show.